The fantasy animated movie "Avatar" is set in the Alpha Centauri system, a real solar system that is nearly 4.4 light-years away from earth. It's 150 years into the future, and Homo sapiens have managed to eradicate all of Earth's native flora and fauna. But for some reason the nature-free lifestyle of our great-grandkids still requires that we import "unobtainium," a mineral of unspecified application that's worth $20 million a kilogram. Even crack isn't that pricey. Obtaining unobtainium is the motive power behind "Avatar," the James Cameron movie that's broken all records for production costs, requiring upwards of a half-billion dollars, or the same as constructing the Empire State Building (after adjusting for inflation). In the film, Earthlings of the future have set up a mining operation on the jungly, predator-infested moon, Pandora, to extract this costly material and send it back to Earth. That sounds like just a bit of innocuous economic activity, but Pandora's locals (the Na'vi), who look a lot like willowy half-dressed fashion models sporting stripes and a blue hue, are not copacetic about having an extractive industry on their home turf. Trouble ensues. 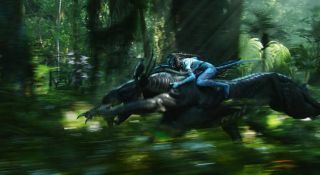 Everyone raves about "Avatar's" visuals, although the film's story line has taken some lumps in the press — it's often described as "Dances with Wolves" meets Pocahontas (Britain's Daily Mail dubbed it "Dancing with Smurfs"). The scale and production values of "Avatar" also raise various, and interesting ancillary issues. For example, are movie actors destined to endlessly emote in front of blue screens, suited up with motion-capture reflectors? Are real people too limited to actually appear in films? And then there's the question — which seems to resurface every half-century — of whether movies and television are finally going to switch everyday production to 3-D? I'm a big fan of this technology, and as a kid persuaded the Polaroid Corporation to send me some sheets of polarizing material so I could make and project 3-D photos. But honestly, I find that I'd much prefer that stories have imaginative rather than spatial depth, and 3-D film can become a distraction both for the producer and the viewer. Processing that stereo information requires effort on the part of both your corneas and your cerebellum. But to the point: Since James Cameron is besotted with space science, it's always interesting to see whether he gets it right in his films. His previous blockbuster, "Titanic," was meticulous — some would say obsessive — about historical detail. "Avatar" is less attentive to accuracy — or at least, plausibility. One could easily bemoan the fact that the turquoise natives are remarkably anthropomorphic, or that the atmosphere clearly has oxygen (you can set fires), but is nonetheless strangely toxic to humans. Also puzzling are the lovely skyscapes, showing Pandora's home planet (a doppelganger for Jupiter) and at least three other moons, hanging around together like an urban gang. Cameron hasn't studied orbital dynamics, clearly, for otherwise he'd know that moons don't cotton to such close companionship. Then there's the idea of an entire society living in a tree — seemingly peaceable, laid-back, and adept at riding big, bird-like lizards. (What is in that atmosphere, anyway, that it can support flying creatures the size of a convenience store?) Yet, despite their pastoral ways, the Na'vi, armed only with bows and arrows and an occasional herd of hammer-head hippos, can deploy like Special Forces, and engage with Marines of the 22nd century. Seems modestly implausible. As I said, I could go on. But my critics will accuse me of nitpicking, and really — since I greatly liked the film — is there any point to saying that a fictional story is, well, fictional? Maybe not, but I do want to note something about the premise, because Tinseltown has used the idea of interstellar mining over and over. Simply put: Is there some naturally occurring element or compound that would really be worth hauling back to Earth from another star system? This question was addressed two centuries ago, when England began to send people (mostly low-grade criminals) to Australia. This population needed something to export to London to earn foreign currency, and they settled on wool. This was not because the Aussies are particularly fond of sheep (although New Zealanders have plenty of jokes about that), but only because wool is very expensive per pound. Sending it back to Europe was expensive, and Australian wool would only be competitive in the London markets if the shipping costs were a small fraction of the product value. Even in the day of wooden ships, this criterion was met. Now let's consider the tariff for sending a kilo of unobtainium back to Earth. Our descendents in this film have some pretty nifty looking rockets, and we hear shortly after the opening titles that the trip to Pandora takes only about five years (as measured on-board). Well, even the nearest other star system, Proxima Centauri, is 4.3 light-years from where you're sitting. That means that transport between Earth and Pandora occurs at 85% the speed of light or more! Getting a kilogram of unobtainium (or anything else) up to that speed, and then decelerating it at the end of the ride, takes at least 1017 joules of energy. That's freshman physics. What's the cost of that energy? Our cheapest joules are supplied by your local utility company at about ten cents a kilowatt hour, or 36 million joules per dollar. At that rate, the price of shipping a kilo of unobtainium works out to $3 billion, or — assuming 2% annual inflation between now and 150 years from now — $50 billion in 2154 c.e. dollars (that's the year in which the film takes place). In other words, the transport costs for unobtainium exceed the value of the merchandise by a factor of more than 2,500! So that settles that. You are not about to pay $60,000 to Amazon as the shipping charge for this month's best seller. Interstellar mining — and the affront to natives it might imply — should be tactfully removed from Hollywood's box of tropes.